In June the IUF launched a global campaign for action to protect workers in the hotel sector from sexual harassment and assault. 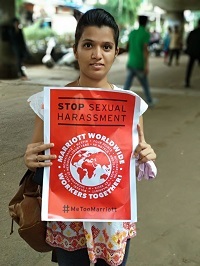 The campaign initially calls on global giant Marriott to negotiate a comprehensive agreement with the IUF on measures to prevent sexual harassment. Marriott, in response, has rejected the IUF call for negotiations but on September 6 announced they would make panic buttons, which enable victims to call for immediate assistance when their safety is at risk, standard in United States hotels by 2020, with other countries set to follow later according to an unspecified timetable. The international chains Hilton, Hyatt, IHG and Wyndham announced similar measures for the US. This one-off action is welcome but is only the first step in finding comprehensive solutions to the violence which plagues the sector. The President of North American affiliate UNITE HERE D Taylor has written Marriott in support of negotiations with the IUF to develop measures to create a workplace environment which can encourage complainants to come forward and ensure their safety and job security in Marriott-branded hotels worldwide. Affiliates have pledged to keep campaigning and demanding that Marriott negotiate with the IUF.